I was watching the weather pretty closely today, hoping to be able to head out and test the new digital-8 video camera I bought a couple weeks ago. So if there was likely to be anything at all interesting, I would head out. The setup looked increasingly good as the day went on. These situations with strong northwesterly upper flow that we get in Illinois can occasionally be quite interesting. It looked like that could be the case today with decent shear arising from winds that veered with height from westerly at the surface to strong NNW at the upper levels. Originally the models had pinpointed SE IL as likely to have the best instability and shear, but steady rain through much of the day had really worked over the atmosphere there. But storms began to fire over northern IL and southern WI, where clearing and heating had occurred. SPC issued a MCD a little before 1:00 indicating likely WW for central and norhtern IL. I checked the radar and saw a cluster of strong storms just south of the Quad Cities. These were in the warm, unstable air and would be fairly easy to intercept since they would move SE or SSE and I would drive NNE, rapidly closing the gap. At 1:45 I headed out, with a preliminary target somewhere between Bloomington and Decatur. By the time I reached Litchfield, I had heard about a blue box for Sangamon and Christian Counties and points north. I stopped briefly at the rest area near the Taylorville exit and checked radar on the DTN system. The cluster of storms SE of the Quad Cities had now morphed into one monstrous storm that looked supercellular and looked to be near or just NE of Peoria. The Springfield NWR was reporting the strongest storms near or just west of Peoria. By the time I got close to Springfield a little before 3, I could see lots of towers and anvils to my north and NW. By the time I was most of the way through Springfield, I could see I was getting close to one of the storms as the sky to my northwest was becoming very dark, and I could see some updraft base off to my NE. Hearing no warnings, I decided to see what was going on farther north and managed to tune in the Peoria NWR - and immediately heard an update on a TOR warning that had already been issued for Tazewell and Woodford Counties, based in part on an actual spotter report of a tornado. This situation presented a bit of a problem. I was rapidly approaching a heavy precip area from what looked to be a very strong storm, though I had heard no warnings this far south. This was not likely the same storm that was causing the TOR warning, as this one was too far south. But to get to the other one, I would have to punch through this one. Though I am not usually big on core punches, I decided to proceed this time because there did not appear to be any warnings on this storm. I hit large raindrops, then blinding rain, mixed briefly with pea-sized hail. The rain was so heavy the water ponded on the highway, and lots of motorists pulled off the road to wait it out. Just as I was questioning my sanity for proceeding in the horrible visibility and near-flooded road conditions, I saw some light ahead so decided to continue. Soon I saw blue skies and the towers of the storm I was after ahead of me. But before I cleared the storm, it had one more trick up its sleeve, and pelted me with dime-size hail just as I broke out of the heavy rain and into what looked like clear air. 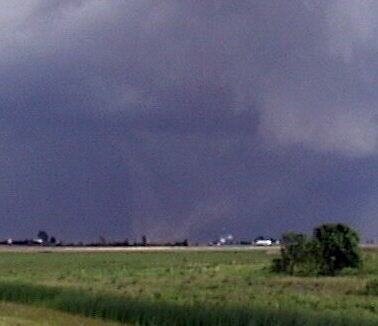 This was around 3:30, just southwest of Lincoln. 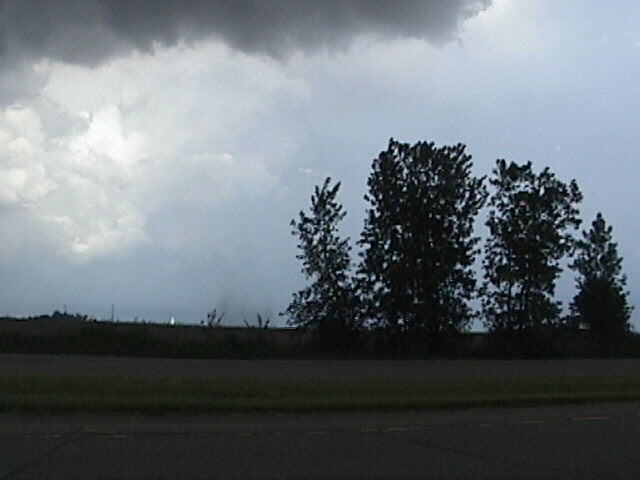 Glancing out the window, I saw knuckled, backsheard anvil overhanging an updraft tower just to my SW. I briefly stopped at the IL route 121 exit on the east side of Lincoln to look at the storm I had come through and get a little video of it. 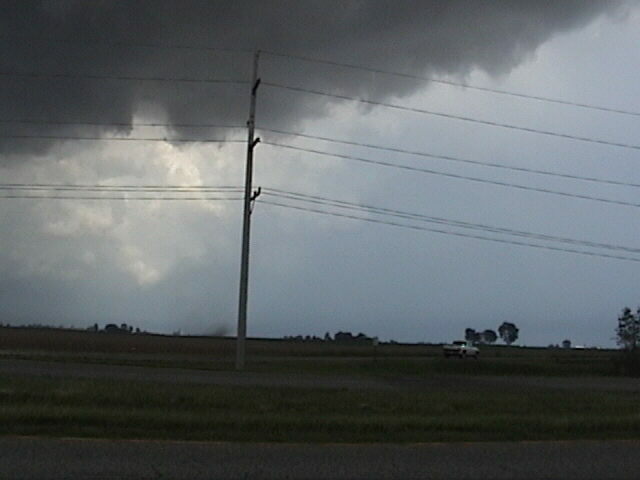 It looked multicellular, with several strong updrafts, including one to my SE that had a scuddy lowering underneath. But continuing to hear tornado warnings on the next storm north, I did not dally long. The warnings I heard were for eastern Tazewell and McClean Counties, but there was also a warning I missed for Logan Co., where I was located. I got back on I-55 and based on reports of the tornadic storm now moving into McClean Co., I selected I-55 where I-55 and I-155 split just northwest of Lincoln. 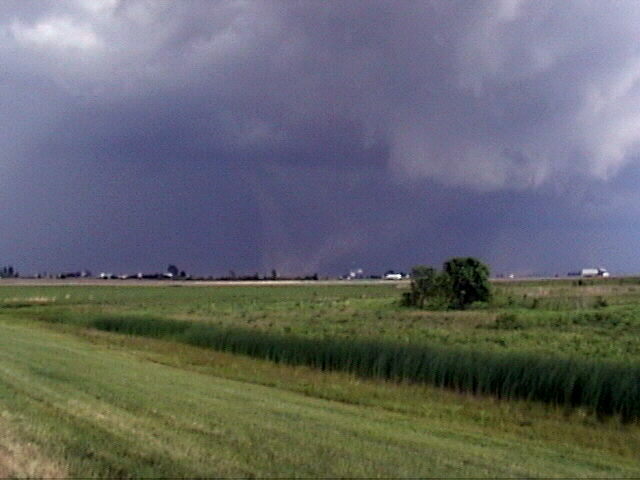 The tornadic circulation was reported moving toward McClean. Glancing at the map, I saw that was not far away, 3 exits and 10 to 15 miles. My strategy would be to exit at Atlanta, one exit before McClean, then get position on the storm. That strategy was out the window almost as soon as I developed it. Looking north toward the storm, I noticed a very large cloud of dust. I would estimate the time around 3:50, but I am not sure of the exact time. At first I thought outflow-related dust plume, but I soon had my doubts - it went up very high, and the highest part in the center seemed to go straight up. Could it be a tornado? It obviously was going to cross the highway, moving SE as it likely was. Fortunately, I was approaching the business route 55 (old route 66) exit NE of Lincoln. I could get off before it crossed the highway. As I crossed over old route 66 and headed for the exit, I could see the large dust cloud crossing old route 66 no more than a mile north. 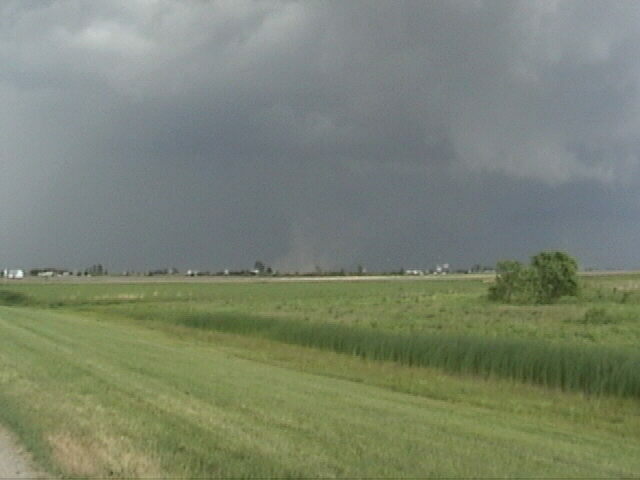 I actually thought about stopping along the ramp but there was no place to safely do so, so I got off as quickly as I could and crossed under I-55 to get on the north side where I could see and videotape the dusty feature - I still was not sure whether or not it involved rotation. As I went under the underpass, I noticed at least a half dozen cars stopped underneath to take shelter and at least one person out of the car, apparently heading for the girders. Besides the fact that this is not generally a good idea, this looked especially silly because this location was not in the path of the feature I was obseving. I got past the underpass, jumped out, and started to get video. Very quickly, it was evident that the dust cloud was indeed swirling, and was still going quite high. Here is a video capture of the dust swirl, looking to the northeast. (Contrast slightly enhanced) I was concerned about what might happen when it crossed I-55, but I then realized that it already had, because I-55 turns to parallel old route 66 right after it crosses over. The large dust swirl was now on the other side of I-55. I videotaped it for 2 minutes from that location, until it passed out of sight behind the elevated roadway where I-55 approaches the overpass over old 66. So I booked south and soon found another spot to videotape, the swirl, which was still going. When it moved behind some trees, I poked south a third time, getting about another minute and a half of video as spotters pursued it south on a nearby side road until it finally dissipated. Here is a video capture of it shortly before it dissipated. (The pickup truck on the right side was a spotter who was following it.) It was on the ground at least 4 minutes after I exited I-55, and I have three and a half minutes of video of it. Additionally, I observed it for 3 to 5 minutes before I was off the freeway, and it may have been there before I saw it. So the bottom line is that it lasted at least 7 minutes and perhaps 10 or more, and travelled at least 2 miles on the ground, moving toward the SSE. So, how do we classify this very non-textbook circulation on the ground about 3 or 4 miles northeast of Lincoln? I would describe it as a weak tornadic circulation. The dust swirl lasted a total of 7-10 minutes, so a little long to call it a gustnado - this was quite a persistent feature. Also, there did appear to be some weak rotation in the cloud base above it. I observed this shortly before the swirl dissipated and got a short video snip of it; it may have been there earlier but I did not see it in my brief glances up at the cloud base, which was pretty much directly overhead. So far as I could see, there was no condensation funnel. Possibly you could classify the feature I saw as a landspout: It formed under the flanking line/RFD gust front of the storm that produced more significant tornadoes and hail in a track just to the east, and moved SSE, at times appearing to move almost due south. Also, it was under the updraft of the largest TCU in the flanking line. Though it was not terribly strong, from a half mile away, it was very impressive and made compelling video. After this feature dissipated, I also got video of a large RFD dust plume and a lowering off to the SE that may have been associated with the Beason or Midland City, IL tornado, but that was too far away to tell. 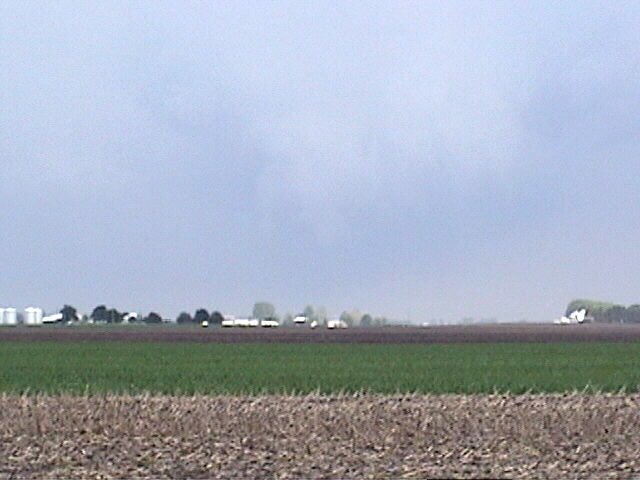 Here is a video capture showing the distant wall cloud and dust plume - note the lowering on the left side of the wall cloud - funnel? It is also worthy of mention that, while I was taping the swirl from the north side of I-55, there was a wall cloud in the background (visible in the first two video captures above), which might be associated with the tornado reported southeast of Atlanta - though the tornado itself is not visible. Both of these wall clouds are likely the same one, probably about 5-7 minutes apart. Needless to say, I'm very glad I chased today - these situations with strong northwesterly upper flow can occasionally be quite interesting. My main motivation today, honestly, was to try out my new video camera; certainly got better stuff than I expected to try it out on! And it did well. The camera and I did well enough that when I got home I told Alice we were eating steak - even better since we had a gift coupon at Outback that we needed to use up! 3:00 p.m. - The supercell is evident, just east of Peoria. The storm I drove through between Lincoln and Springfield has not yet developed. 4:00 p.m. - The supercell is east of Lincoln, around or just after the time I saw the weak circulation. Stronger rotation associated with the meso a few miles east was producing reports of torndoes around this time southeast of Atlanta, near Beason, and near Midland City, where Chris Novy got closeup video of a tornado. Note also the next storm south, which looks strong but multicellular, which was responsible for the hail I drove through. 5:00 p.m. - The storms have moved rapidly south, and I have no chance of catching up to them again. Local storm reports can be found here. As always, I would love to hear from anyone else that was on this storm. You can email me at jfarley@siue.edu.